Our primary objective is to provide our reader’s the easiest and fastest way to make money online. And survey sites is top on that list and due to this the quest of finding the best survey sites are still on. We have already shared some of the best survey sites with our readers. Including Swagbucks, Opinion outpost, Globaltestmarket, Mypoints, and Mysurvey. We all know survey sites are best ways to make money in extra time. And to increase you’re earning you can have accounts with multiple survey sites. Like I have more than ten accounts with different survey sites. This allows me to attempt multiple surveys in a single day. The primary problem with most of the survey site is the availability of enough surveys so if you multiple accounts you can have enough surveys to attempt. This time we brought Ipsos I say a great survey site to make some extra cash in free time. you will have the opportunity to get an online survey, product testing, mobile surveys, and video Surveys. I say is a survey site which is powered by Ipsos. One of the leading market research company. They are operating their business in more than 100 countries and conducts 700 million interviews every year including 5,000 clients. The company was founded in 1975 is the third largest company in the world based on survey research. I-SAYoffers surveys related to products and services for those companies who want to do market research and are looking to figure out what are their potential buyers and clients. There are many reasons due to which a company may need for a market research. If you are looking improvement areas in your existing product, want to launch a new product and not aware of the targeted audience, and what is the future growth of your market. Whenever you attempt a survey with I-SAY you get some points for that and those points you can redeem for gift cards, Paypal cash, donation and sweepstakes entries. But before you attempt any survey you first need to signup. Visit their official website and click on a sign-up link. Supply all the required details and your account is active to take the surveys after email confirmation. It only takes a couple of minutes to complete the whole sign-up process. Similar to other survey sites here also you have to qualify for the survey. In case if you disqualify you will get 5 points for your attempt. Here you also find polls predictor which does not give you any points. But this gives you chance to enter in I-say Prize draws. In polls, you only have to answer yes or no these are completely different from the surveys. Currently, they are active in 11 countries including United States, Canada, and the United Kingdom. Please refer your country before registration. And you must be 18 years old at the time of registration. It is a year based program where you get bonus points for completing a certain number of surveys. Like after completing 5 surveys you get 25 points and 50 after 10 and so on. More surveys you complete more bonus points you will receive. Poll Predictor allows you to win more prize draw entries. Every time you complete a survey you get a chance to participate in polls predictor. With 200 points you can take entry towards winning a trade to travel draw. Quarterly 10 panel members get a chance to win 5000 points through click draw opportunities. If you are one the most active members you have a high chance of winning this sweepstake. You can easily earn 100 points for referring your friends, family or any other person who is interested to make money with the survey. Sometimes you will find they are offering more than 100 points for referring members. These usually it happens when they are running any promotions scheme. Referral is the most easiest way to make money. The moment someone complete it’s profile you get your referral points in your account. How to Redeem your I-SAY points? 100 Points of I-SAY is equal to $1 and there are thresholds depending upon the redemption criteria you are choosing. You need $10 for Amazon gift cards which is equal to 1000 points. $15 for Target gift card and you need 1500 points for redemption. 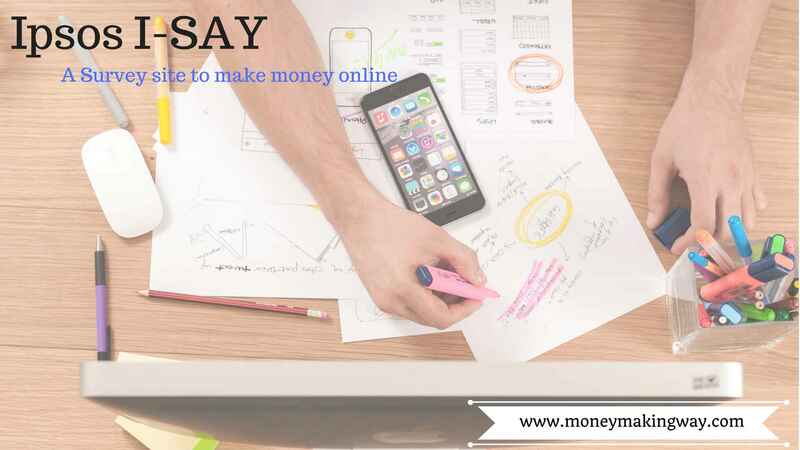 Ipsos I-say is legit survey sites which provide their members to attempt surveys and exchange of that they credit some points to your account. Which you can further use to redeem against gift cards, Paypal cash, donation and entries for sweepstakes. Unlike other websites, it does not include multiple different tasks but purely based on surveys and availability is also quite high.